Our Curriculum this School year. This year I was able to attend a homeschool convention and at the Geography Matters vendor booth I found our treasure for this year! I really like the idea of unit studies in home education as it eases my workload with multiple students and keeps us all on the same learning path together. I have tried other unit studies and they overwhelmed me with too many options of exploring the subject matter. An overwhelmed or confused mind says no, so we ended up searching for new ways of learning and that was expensive and frustrating for me. I was looking for SIMPLE and FUN in our learning path this year, and yet something that would still CHALLENGE their minds and grow their character. 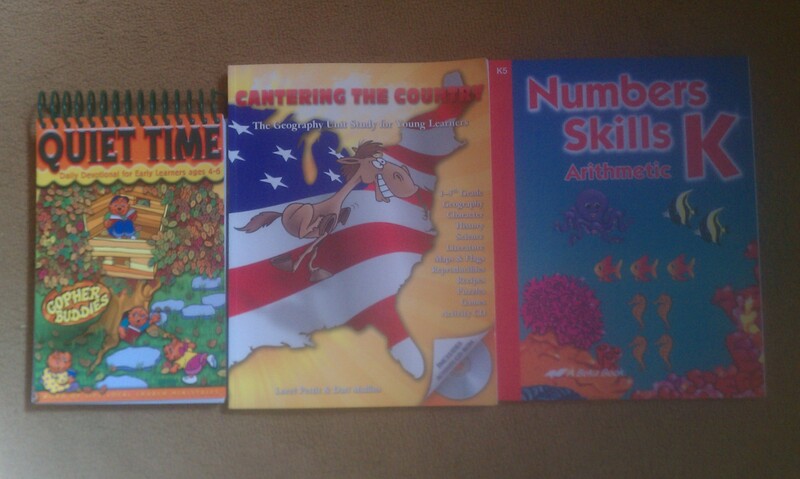 Our core unit study- Cantering the Country, encompasses everything we need except for math. Find it at www.geomatters.com. This has each of the 50 states in it, an overview of their history and important facts, a list of resources for the state in general and then suggested significant people in history from that state to study, science of their state bird, tree, rock, flower; and character of their state motto or pledge. We are weak in our language arts so I also have Learning Language Arts Through Literature- the Purple book, to enhance this part of our studies. The Word of Life Quiet Time will be our family Bible core, even John and I have one and no matter what age, we all read the same passage. Our church is starting Word of Life Clubs this year too so it will help the kids with that program as well and we’ll have more accountability in our verse memorization too. I’m really excited about this part of our program! Go Science is a 6 pack DVD set I bought from Vision Forum ministries. It has high energy science demonstrations that also have spiritual applications to point to our Creator. My 5th grader has a major hunger for experiments that I can never seem to satisfy so I am hoping that watching these will excite all of us to try them ourselves when possible or be happy some days, just watching his demonstration. Math is going back to A Beka Arithmetic. We tried Teaching textbooks last year, and while he loved the computer aspect of it and many days voluntarily did more than one lesson, I felt it was leaving gaps in his math program that had been so strong with A Beka since preschool. We are actually finishing a 4th grade book before I even purchase 5th grade because I feel like he had too much fluff math and not enough of the clues and foundation that he will need in the coming years. Eat your Way Through the USA is a cookbook that can also be found at www.geomatters.com. Our kids love to help in the kitchen and this adds to the sensory learning aspect of going through each state in our unit study! Cantering the Country unit study. 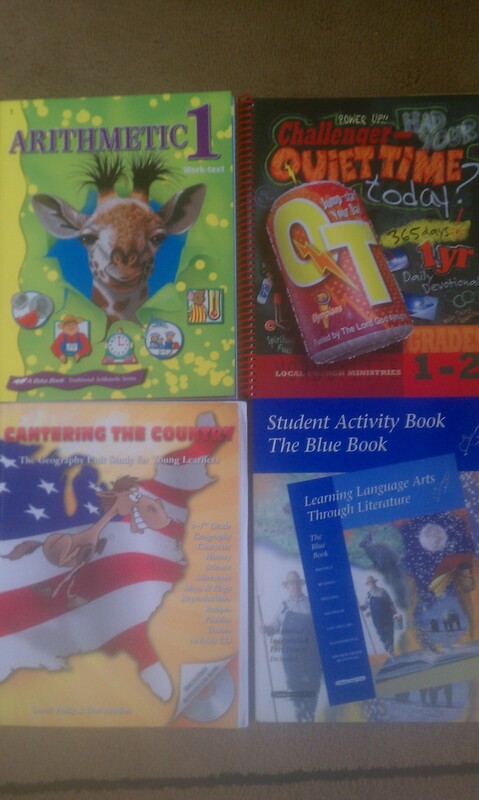 Learning Language Arts Through Literature, the Blue Book. Word of Life Quiet Time. 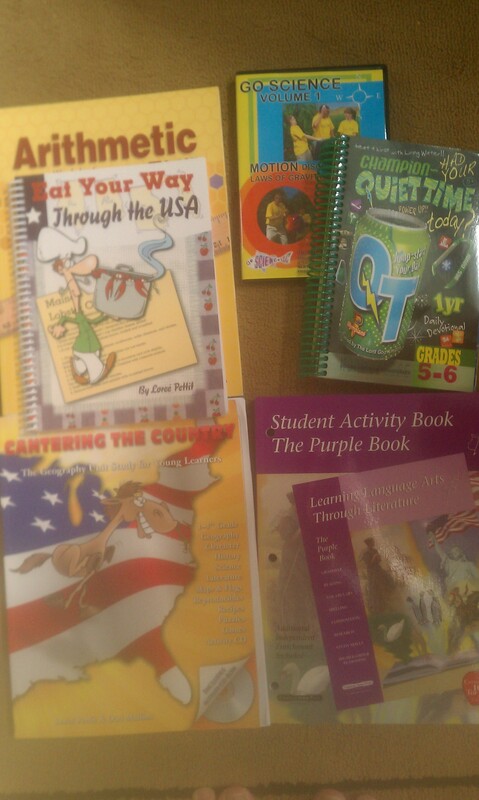 Cantering the Country Unit Study, this is for 1st-5th grade but she is very capable of learning with us. Word of Life Quiet Time – Gopher Buddies. We’ll be doing lap books for each state each week (some states may take more time, some less) and I am hoping to have the kids do presentations each week on Skype for family members to: 1. help solidify what they’ve learned by sharing it, and 2. help them grow in being confident presenters. No matter what, I want to instill a desire to learn in our children. I want them to love discovery and look at each turn of the page as an exciting adventure. I know not all school is fun for every learner, and we definitely have areas to improve in, such as writing, spelling, and even reading, but the important thing for me is to keep trying to find the style that will click with them and pursue it. I think we found it this year and I am so thankful for that.